Now shipping: It’s the Great Pumpkin Charlie Brown. What, that’s not specific enough? You’re right. 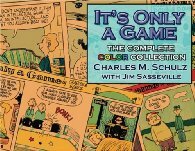 I should say that now shipping is the book adaptation of It’s the Great Pumpkin Charlie Brown. What, still not specific enough? Okay, it’s the Running Press book adaptation of It’s the Great Pumpkin Charlie Brown. And the odd thing is, that’s still not specific enough. 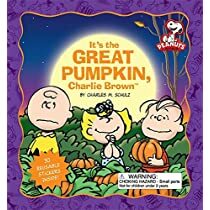 This new book, their 24-page paperback adaptation of It’s the Great Pumpkin Charlie Brown, with a sheet of stickers bound in, is actually the third Running Press adaptation that they’ve done in just under 4 years. 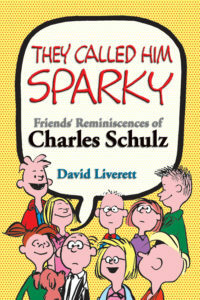 In 2004, they released a minibook adaptation. 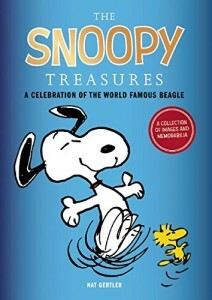 Last year, they released a kid’s board book adaptation. Now this, and no, it doesn’t just recycle the earlier content. Of course, it doesn’t really capture the effect of watching the special, which is mostly a bunch of funny set pieces that the book just has time to explain rather than recreating the effect. The art adaptation is pretty good (and they avoid the five o’clock shadow problem that has plagued some recent efforts), although there is still a problem with arranging layouts where the characters are at different distances. 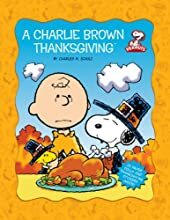 A bit more fun is Running Press’s new adaptation of A Charlie Brown Thanksgiving. For one thing, the special is a bit more solid in the story department; while it has its set pieces, it also has a real, developing story. Plus, some key parts of the story are missing from the main text – some of the characters and props are on 6 pages of stickers, with the young reader instructed what pages to put them on. Of course, that’s something they can only do once; then the stickers are in. 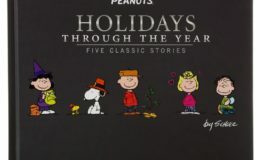 The book also has cardboard figures of Charlie Brown, Peppermint Patty, Linus and Snoopy to cut out, and a dining table to cut out and fold. So this might actually making a nice little gift for the niece you’re visiting for Thanksgiving.